Exhale! Finally, I can breathe a sigh of relief. Kimba, Sofia, Gino, Salteña and Chupino arrived safely. After a day of loading, a 9-hour flight from Argentina to Miami and a 38-hour drive, the anticipation was making our hearts skip a beat. 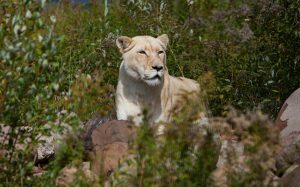 Our primary concern was for the eldest lioness, Salteña. When the two semi-trucks pulled in and we heard Salteña roaring her displeasure for the trip, tears began flowing down my face. 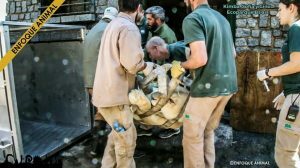 Years of planning all led up to this – giving a new life to five lions. Salteña and Chupino were unloaded first and brought into our quarantine areas. At first, they were too shy to leave their transport crates. But, it didn’t take long for both to emerge and begin exploring their indoor and outdoor areas. Our hearts melted as Salteña curled up in the soft straw in the sun and took a long, and well-deserved, cat nap. Chupino chose to play with his toys, rub all the pine trees and mark them as his. Next was Gino. He was quiet and calm in his crate. As a teenager, he was a little less confident about leaving his transport crate than the others. He waited for everyone to leave before he slowly took his first few steps out. He strategically surveyed the habitat, taking his time to take everything in. Tigress Sabrina was thrilled about her new neighbor, while lioness Shanti Deva made sure to tell him she is still alpha of the pride. Kimba and Sofia were last. They had no problem darting out of their transport crates to explore their new home. Kimba went directly up to the building and stuck his head in to see what was inside. Sofia climbed the rocks before finding Kimba on the other side of the habitat. They were both so happy to find each other, having been separated for the trip. They curled up in the tall grass together and enjoyed being able to finally rest. The humans had a very long worthwhile day! A day in the making for several years. We couldn’t have asked for an easier unload. Our hearts were filled with such joy and relief, seeing how quickly all the cats are adjusting to their forever home here. That’s not always the case. Chupino hasn’t stopped roaring about his affection for Salteña, while she dismissed his advances through their shared wall. Salteña’s favorite spot is her heated building and straw bed – who can blame her after living in a dark, cold cage for so long. 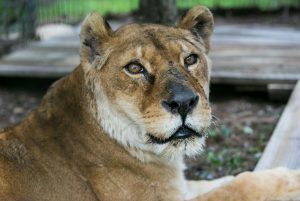 Kimba was known as the assertive lion, while Sofia was very standoffish. That all changed when they had a larger area to explore and could be fed outdoors, as well as inside. Her former caretakers were amazed and so happy to see this positive change in her. Gino found the highest platform in his habitat and chooses to survey everything around him in a cool, hipster manner, while neighbor Shanti Deva doesn’t seem impressed. We can’t thank YOU enough for making this possible for them – and us! Hearing lions carol once again alongside Shanti Deva makes the sanctuary feel whole again. 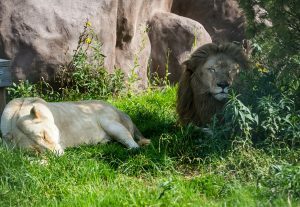 This pride is very different than Aslan’s original pride, but is just as special in so many ways! I look forward to sharing news about each and every one of the lions. Especially as we complete Pride Prairie, the new lion area you’ve helped make possible for them. 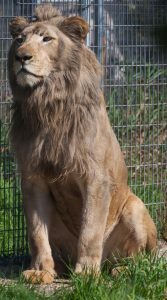 Will you consider being a sponsor parent for Saltena, Chupino, Gino, Kimba or Sofia. Learn how HERE!